Essex Day was started 39 years ago as a clambake when residents, lead by Jan Peden and Bill and Margo Cooper, decided to liven-up the last month of summer. Neighbors contributed to the celebration by making pies, cookies & ice cream . It became a yearly event, morphing into a market day with home-made goodies, attic treasures and artwork being offered for sale to whomever happened along the streets. On August 4th, exhibitors, farmers and artists from across Essex County and Vermont will once again assemble on Main Street and the Town Hall lawn to offer amazing artists treasures, farm fresh foo and other goodies. There's live music throughout the day. This is a rain or shine event. 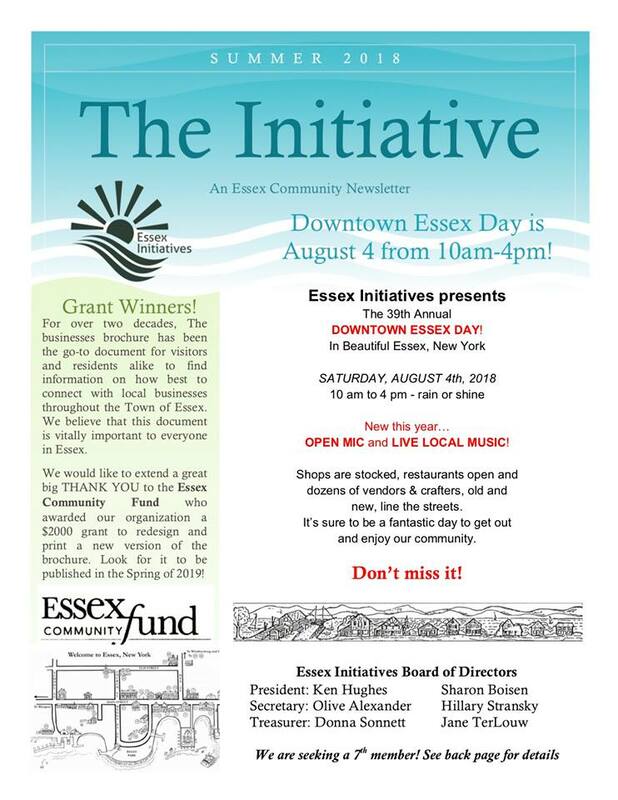 Downtown Essex Day is sponsored by “Essex Initiatives”, a volunteer community group. For more information, call (518) 963-7494.